Over the last two weeks, we've been searching for promising dividend growth stocks that trade on the U.S. markets. Our original objective was to identify "quality dividend-paying small- to mid-cap companies with sustainable competitive advantages and the potential for 7%+ annual dividend growth over the next 7-10 years." After running a broad screen to reduce the number of initial contenders, we put six companies through the Dividend Compass spreadsheet to get a better feel for the health of the companies' dividends. Of course, all of that work was based on historical data. Today, we'll dig deeper into the two finalists -- MTS Systems and WD-40 Company -- to determine how those names might perform going forward. Further, the research we've already done shows that both companies have solid balance sheets, are consistent generators of free cash flow, and have established good dividend track records. As such, we won't spend too much time digging into those data points today. Instead, we'll look at the two companies' competitive advantages (if they indeed exist), management quality, and consider their current valuations to determine whether or not they're worthy of investment right now. After digging into WD-40 and MTS this week, it's clear that the screening and Dividend Compass process uncovered two promising companies. Indeed, they check off a number of Peter Lynch's 13 signs of a perfect stock. 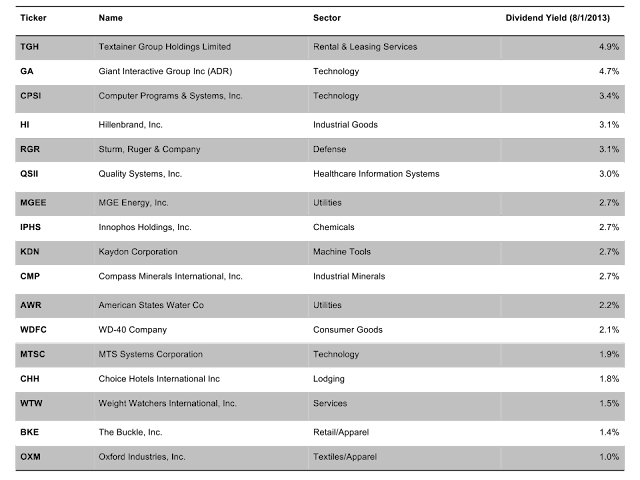 Among them: little analyst coverage (officially, MTSC has two analysts, WDFC has four analysts), they each have a niche, and the companies are buying back stock (though this isn't always a great thing, in my opinion). As with most endeavors, the hardest part of the investing process is the last stretch. Most investors go through the screening process and read historical financial statements. Where you can separate yourself as an investor is in this last stretch of research -- digging for the qualitative factors and getting a feel for valuation. 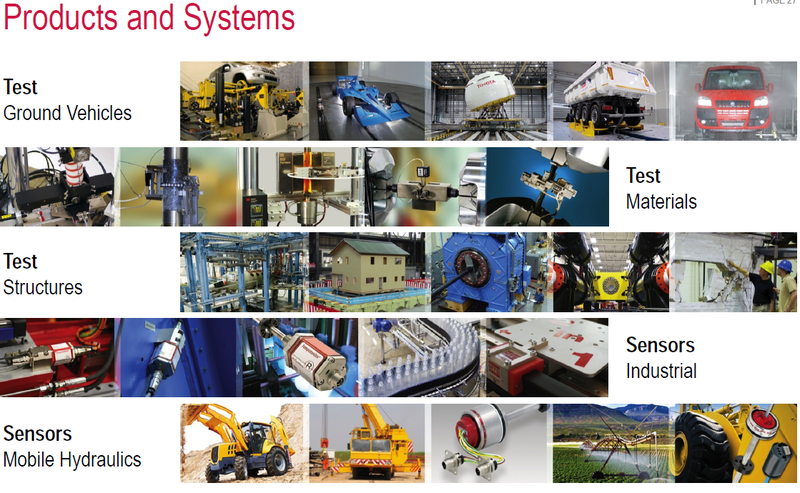 MTS Systems supplies test systems and industrial sensors to a number of end-markets such as the automotive, aerospace, fluid power, and manufacturing sectors (i.e. mostly cyclical industries). About 80% of revenue comes from the test segment, which designs force and motion systems for determining a new product's mechanical properties; MTS commands a 16% market share of the global testing product and service industry. The sensors segment helps customers improve the efficiency and safety of their automated manufacturing processes and also measures fluid displacement and liquid levels; MTS has a 6% share of the global sensors market. MTS also has a wide geographical reach, with an established presence in the world's major manufacturing centers. Does it have sustainable competitive advantages? Historical financials seem to suggest that MTS has a sustainable competitive advantage. It may lie in the "mission critical" nature of its products. Firms investing many millions of dollars in large industrial products simply cannot afford to forgo strenuous mechanical and fatigue testing before rolling the new product out to customers. The warranty or recall risk from a flawed piece of equipment may well outweigh the testing cost. Further, some products may be required to undergo such testing due to government regulation. But these could simply be industry-level advantages rather than a specific advantage to the firm. Where MTS may set itself apart is with its established brand and reputation in the industry for doing quality testing, particularly for larger-scale projects. I'd imagine that most smaller-scale product testing can be done internally and that the competition for smaller-scale projects is pretty fierce. Larger-scale testing projects can last up to three years, however, and there are probably only a few companies that can handle such work -- MTS being one of them -- and customers are unlikely to switch providers halfway through the testing period. As such, I'd say MTS has a slight advantage stemming from switching costs for larger projects, but the depth of the moat will fluctuate along with demand for these larger-scale projects. The MTS leadership team is relatively new, by which I mean less than two years in their roles. It seems a few years ago that the company got in a little trouble regarding some disclosure items relating to government contracts. This appears to have been one of the primary drivers behind the August 2011 resignation of the former CEO and the re-shuffling of the executive suite. Such dramatic moves are necessary when there's been an ethics issue, but it also likely means that the company will be in transition mode for a few years. Unless you know a lot about the new management team (I don't) and the effect the changes are having at the ground level (again, I don't), it's hard to make a bold turnaround call (so I won't). Short-term cash bonus metrics are based on EPS, EBIT, revenue, and orders. Not my favorite set of metrics, but not terrible given that MTS remains squarely in the growth stage of its lifecycle. In time, I'd prefer to see less emphasis on top-line growth and more emphasis on free cash flow and profit growth. With 40% of testing orders coming from Asia, I have some concerns regarding the Chinese economy -- specifically, how the shift from an investment- and manufacturing-driven economy to a customer-driven one may affect demand for MTS's testing services in the region. MTS aims to double its revenue to $1 billion by 2018 and robust demand from the Chinese market will likely be necessary to achieve that goal. Is it a good buy today? MTS's average return on equity over the last five years is about 18% and its dividend policy is to pay out approximately 30% of earnings, implying a back-of-the-envelope sustainable growth rate of between 12-13%. Not bad against a P/E ratio of 18.6 times (~1.5 PEG), but not a slam dunk, either. Doing some DCF work on MTS with a range of reasonable growth assumptions, I'd put a base case fair value near $60 per share, which is in-line with today's market price. I'd need a margin-of-safety of at least 20% with this type of business, so a good entry point might be closer to $48. MTS is definitely a good one to watch in the event of a market pullback and there's significant dividend growth potential, but given my uncertainty around its sustainable competitive advantages and a newer management team, I wouldn't make it more than 2% of my portfolio. 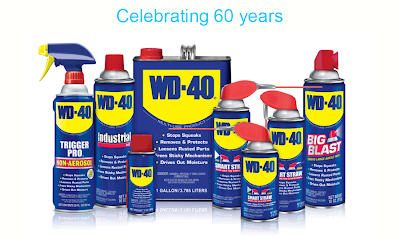 Anyone who's spent time in a garage, fixing squeaky hinges around the house, or worked on bicycles has likely used a WD-40 product. In fact, the vast majority of the company's revenues are based on the original WD-40 formula (WD-40 stands for “Water Displacement perfected on the 40th try”) and the company's documented over 2,000 uses for the secret formula. The company also owns a number of related consumer/industrial cleaning products such as Lava soap and X-14 mildew stain remover. Its products are sold in 187 countries, so the company does have a wide geographic reach (about 40% of sales are U.S.-based). For starters, the WD-40 brand name is extremely valuable. I can't even name a substitute product. It's a trusted brand, can charge a premium price, and I'd even argue that there's a slight emotional connection to the brand (i.e. "this is the brand that my dad always used in the garage"). Beyond the brand, the company's ability to build upon a single secret formula and create multiple products is an example of economies of scope. This results in a cost advantage that would-be competitors would struggle to match if they attempted to go head-to-head with WD-40 on a certain product line. The company's ability to consistently generate double-digit returns on capital is another indication that an economic moat is likely present. Finally, another telling statistic: in 2012, WD-40 generated nearly $1 million in revenue per employee. I like to see at least $250,000 in revenue per employee, so this is definitely a sign of a strong company. One thing that I really like about WD-40's management team is that all seven corporate officers been with the company for more than 15 years. My personal preference is for the companies I own to promote from within and to have a deep bench of talent in the event an executive leaves or retires. This is particularly true for a company with a strong corporate culture, as it supports cultural continuity. Now, a company with a rotten corporate culture may need to hire an outsider to shake things up, but all else equal I prefer internal promotion in the executive suite. CEO Garry Ridge has been with the firm since 1987 and the CEO since 1997. During his tenure, the stock is up 319% cumulative, or about 9.2% annualized, compared to a 200% gain, or 6.9% annualized, for the S&P 500 over the period. The stock's also outperformed the S&P 500 by about 40 percentage points over the last five years. All this is to say that long-term shareholders should be fairly happy with the way the company's performed under Ridge's leadership. WD-40 also keeps the chairman position separate from the CEO role, which is textbook best practice for corporate governance. I'm not crazy about management's bonus incentives, which are primarily linked to EBITDA. EBITDA is one of my least favorite financial metrics (Buffett called trumpeting EBITDA a "pernicious practice" in the 2002 letter; Munger called it "(expletive) earnings") because interest, taxes, and depreciation are natural and recurring shareholder expenses that shouldn't be ignored. I could rant on about EBITDA, but I'd much prefer this otherwise high quality company to use more shareholder-focused incentive metrics such as net income, free cash flow, and/or economic value added (EVA). A potentially limited growth runway. 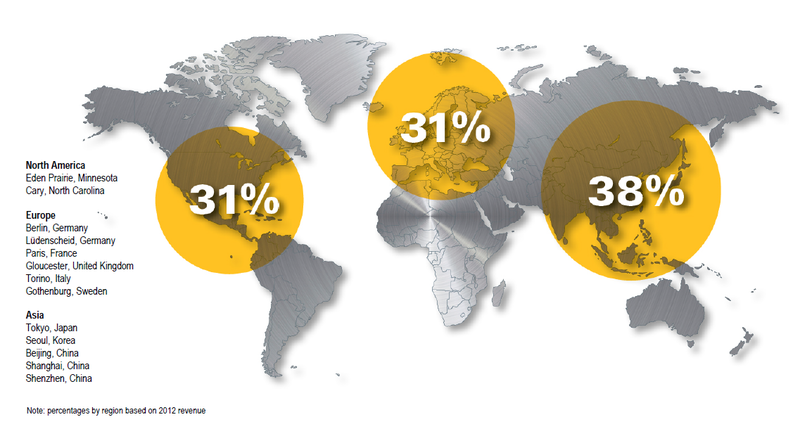 With its products already in 187 countries and a sizeable portfolio of products already built around the WD-40 brand, what will drive top-line growth in the medium-term? I have no doubt that consumers will continue to buy WD-40, but can the company deliver high-single digit/low-double digit earnings growth without becoming more active on the M&A front? WD-40's consistency and high quality hasn't been overlooked by the market and the stock has historically traded at a premium. WD-40's five-year average P/E is 19.1 times versus 17.2 times for the S&P; today it's trading at 22.7 times. Not exactly cheap on that basis. But what about growth? Based on the company's five-year average return on equity near 19% and its dividend payout ratio near 50%, the "sustainable growth rate" is about 9-10%. An implied PEG ratio near 2x isn't great, either. Its current dividend yield of 2.1% is also well-below its five year average closer to 3%. Running a quick valuation on WD-40, I put a fair value on the shares at $52 (currently $58.52). I'd look to buy with at least a 15% margin-of-safety, so a good buy-around price today would be $44. I really like WD-40 as a company. Hopefully the EBITDA-based incentive metrics go away, but otherwise I'd be happy to own WD-40 in the event of a market pullback. Ideally, I'd like to pick up the stock with a yield closer to 3%, which is about what I'd get if the stock traded near $44. MTS Systems and WD-40 are both intriguing dividend growth candidates, but neither appears to be a good value at the moment. MTS has more dividend growth potential than WD-40, but also carries more risk. All in all, I think this was a worthwhile exercise. We dug into two promising dividend growth opportunities and now have two good names to keep on our watchlists. What do you think? Please let me know in the comments section below. Note: I switched the comments format back to the normal setting as the Google+ format was simply not working well. You can also reach me @toddwenning on Twitter. Last week, we set up a simple stock screen with an objective of "Identifying quality dividend-paying small- to mid-cap companies with sustainable competitive advantages and the potential for 7%+ annual dividend growth over the next 7-10 years." We then employed a five-minute "sniff" test to determine which of the companies deserved a closer look. This week, I ran each of last week's six surviving stocks through my Dividend Compass* spreadsheet (free to use and download) in order to get a better feel for the companies' underlying dividend fundamentals. Of this group of six, I'll choose 2-3 for a deep-dive (competitive analysis, valuation, etc.) in next week's post. If they end up being good buys right now, I'll put some money into them. If not, I'll keep them on my watchlist. Computer Programs & Systems: CPSI has the highest yield of the lot and scored very well in most of the Dividend Compass categories. It fell short where it counted, however, particularly in the dividend cover categories. Over the last five years, for instance, CPSI scored either a 1 or 2 in free cash flow cover -- the highest-weighted factor. Earnings cover was just slightly better. CPSI also held its quarterly dividend at $0.36 per share between February 2006 and November 2011. Combine these findings and it seems like CPSI has generally lived on the edge with its dividend payout. The debt-free balance sheet is attractive and I give the company credit for not cutting its dividend during the financial crisis, but the consistent lack of dividend cover makes me a little nervous for a high-yield stock, let alone a dividend growth stock. A year or two of bad results and the dividend could be at risk. At best it would be held steady, which isn't an ideal scenario for a dividend growth investment. Quality Systems: QSII's stock is up nicely over the last two months, but it has dramatically underperformed the S&P 500 to the tune of 80+ percentage points over the last two years. The dividend has also been held at $0.175 per quarter since March 2011. In short, something isn't quite right here. Underlying dividend health has also deteriorated as margins and returns have suffered over the last eighteen months. Though the five-year average score is decent, recent results are reason for concern. Compass Minerals: One of the reasons that I look at multi-year scores is that some companies are in cyclical industries and results in a given year may not be representative of the company's dividend health. Compass Minerals is one such company, as much depends on the severity of winter weather in North America (for the salt business) as well as potash pricing. In good years, the dividend is well-covered by free cash flow and the balance sheet looks pristine, but dividend health deteriorates a bit in down years. 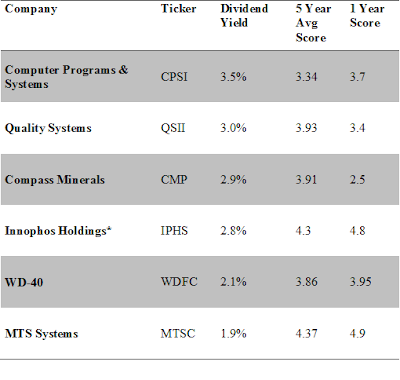 Over time, however, the 3.91 of 5 score on the Dividend Compass is pretty good. I have some concerns about the changing competitive dynamics within the potash industry, but as a current shareholder I have long-term confidence in the business's prospects. Innophos Holdings: Having IPO'd in 2006, chemicals company Innophos has a fairly short dividend track record that begins in January 2007. Further, its quarterly payout was held steady at $0.17 per share from April 2007 to January 2011, but has since increased at a decent clip. The nearly four-year hiatus from dividend growth is a definite negative, but the other dividend health metrics have been consistently strong. Over the past twelve months, however, profit margins and returns on capital have been disappointing, so if Innophos passes onto the next round I'll need to figure out if this is a temporary issue or the start of a bad trend. WD-40: As I mentioned in last week's post, WD-40 is a company that I've had my eye on for some time. I really like the corporate culture -- the company has near-perfect employee reviews on glassdoor.com -- and it has over 100,000 members in the WD-40 Fan Club. The company scored a little below what I had expected on the Dividend Compass, dragged a bit lower by underwhelming dividend growth over the last three years. Instead, the company has increased its buyback activity, which I'll need to look into further if I pass the company into the next round. 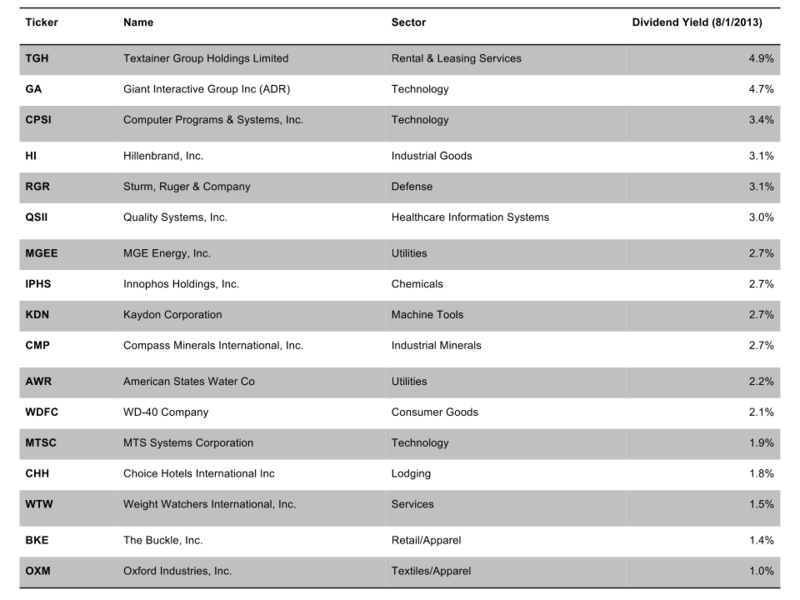 MTS Systems: Of the six companies that made it to this round, MTS Systems had the highest Dividend Compass marks including an almost perfect score in calendar year 2012. The 1.9% dividend yield is a bit pedestrian, but the balance sheet is very strong and the company has generally produced more than enough free cash flow to cover the dividend while increasing its payout over time. I do have a few concerns about recent performance that will need to be addressed if MTS Systems proceeds to the final round. The Dividend Compass revealed a lot about each stock in about 10-20 minutes, which I think saved a good deal of time by not needing to spend an hour-plus reading through each company's annual reports. 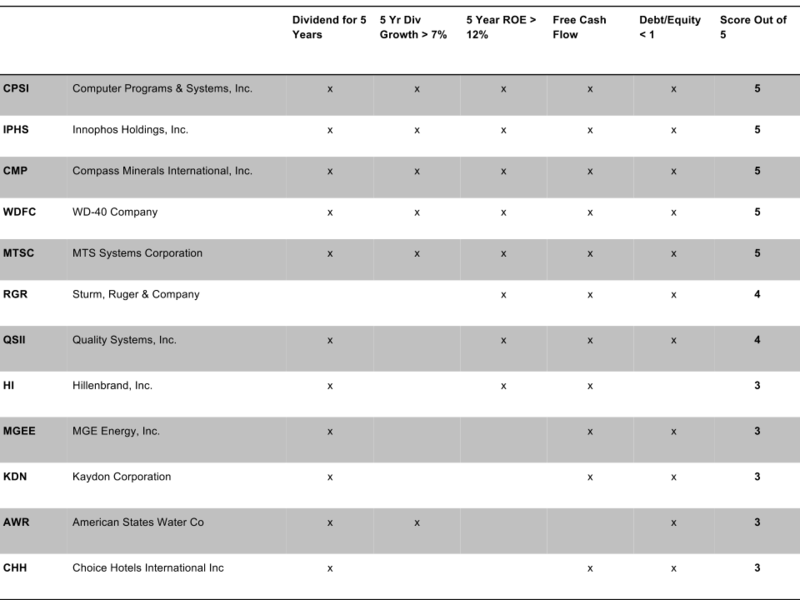 By not having to conduct a deep-dive on six companies, I can now focus on 2-3 names in the next round. I'm not putting CPSI through to the next round. Even though CPSI had the highest yield of the group, I simply can't get past the consistently-low dividend cover. CMP is a very well-run company and I believe it is an attractive candidate for further research, but because I already have a position in the company and want to learn more about recent developments in the potash industry, I'm going to hold off on doubling-down on it. QSII might be a really interesting research subject from a value/turnaround opportunity standpoint, but the fall-off in margins and returns over the last eighteen months makes me concerned that there's been a significant change to the competitive dynamics within the industry. The recently-stalled dividend growth also gives me pause. As such, I'm not putting QSII through to the next round. I'm also not moving forward with IPHS on account of its relatively short and unproven dividend track record, but its DC numbers were good and I'd definitely consider looking into it down the road. I started out thinking that WDFC would be a sure-thing to make it into the final round, but I was disappointed with its score on the DC. I went back-and-forth on this one a bit, but decided to pass it through to the next round as I think it's a fascinating company to discuss. One of the key research topics will be why dividend growth hasn't been as robust as it perhaps could have been in recent years. MTSC's strong DC scores were a nice surprise and I'm also going to put it through to the final round. Results have been a little shaky recently, but we'll figure out next week if those are temporary issues or not. Both companies' yields are around 2%, which isn't much to write home about, but the yields are comfortably above the Russell 2000 yield of 1.4%, and at first glance, both businesses appear to have the potential for 7%-plus dividend growth over the next decade. At the very least, they're worthy of further research. In the concluding post of this three-part series, we'll take a much closer look at WDFC's and MTSC's businesses and do some valuation work on them, as well. Thanks for reading and please post any comments, questions, or criticisms below. You can also contact me on Twitter @toddwenning or by email here. *Frequent users of the Dividend Compass will note that I have recently blocked out a few of the input categories from 2004-2006. Those data points don't have an effect on the Dividend Compass scoring system and I wanted to eliminate some of unnecessary fields. Please let me know if you have feedback on this. Thought I'd try something different here on the Clear Eyes Investing blog. I was planning to add a few dividend growth stocks to my watchlist -- maybe even buy one or two if they're trading at a good price -- and figured I'd share my research process over the course of three blog posts. In today's post, I'll establish a research objective, screen for ideas, and put each of the ideas through a "five-minute sniff test" to determine whether or not they're worthy of further research. In next week's post, I'll put the handful of remaining stocks through the Dividend Compass spreadsheet in order to learn a little more about the companies and the dividends' sustainability and growth potential. In the final installment, I'll hopefully have two or three good ideas that have passed the initial tests. I'll do more detailed research on the select names, consider their valuations, and potentially invest in them. I hope this will be an interactive process. So please share your comments, questions, and criticisms along the way! Identify quality dividend-paying small- to mid-cap companies with sustainable competitive advantages and the potential for 7%+ annual dividend growth over the next 7-10 years. I typically include a metric for financial leverage such as debt/equity, but depending on how many companies show up in the screen, I'd rather evaluate leverage manually. Also, for this exercise, I'm sticking with shares that trade on the U.S. markets, but the same process and principles should apply to other markets. Right off the bat, then, we can eliminate a few names as their yields fall outside my desired range. Textainer Group and Giant Interactive have yields that are too high for an ideal dividend growth investment. Perhaps they're good value or even high yield investments, but from a dividend growth perspective, you have to wonder why they're trading with such high yields in a bullish market like we have today. You would think that if the companies had strong growth prospects that the stocks would be bid up to the point where the yields better approximated the Russell 2000 Index average yield of 1.4%. I'm also going to eliminate Weight Watchers International, The Buckle, and Oxford Industries. Good companies perhaps, but their yields fall well below the 2% minimum. MTS Systems and Choice Hotels are right on the border, but we'll hang onto them for now. With the list whittled down, let's put the remaining 12 names through the five-minute sniff test. With so many stocks to sort through in a typical screening exercise, it helps to have a "sniff test" process in order to make the most of your time. Has the company paid a dividend for at least five consecutive years without dividend cuts? Has the dividend been increased by at least 7% on average over the last five years? Is the five-year average return on equity/capital over 12%? Has the company generated free cash flow in at least four of the past five years? Is the debt/equity below one? Fortunately, this information is also fairly easy to find using free sources and public filings. Morningstar*, for example, lists key ratios going back 10 years and financials going back five years. I also consulted Yahoo! Finance dividend history for each company. Sturm, Ruger & Co also scored an impressive 4 of 5 and its recent dividend growth has been nice, but it reinstated its dividend less than five years ago in May 2009. I'm also going to discard the five companies that scored 3 of 5. They may make for good investments from a value or growth perspective, but I'm less convinced that they're attractive dividend growth candidates. 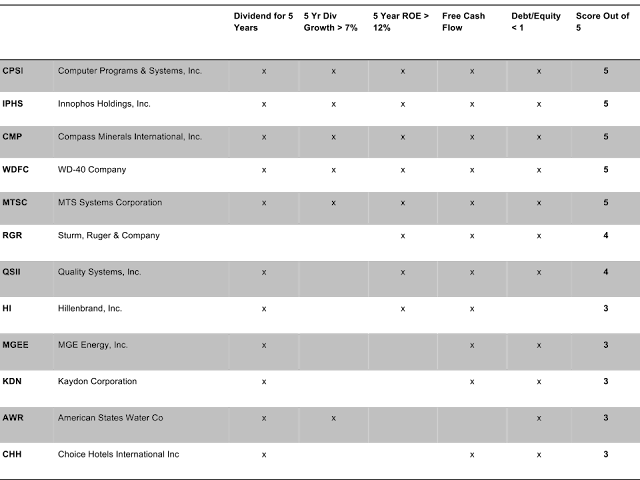 American States Water checked off the two dividend boxes, but its 10-year CAGR dividend growth is just 4.9%. It might be worth looking into if you have some spare time; however, for the purposes of this exercise I'm keeping the list of candidates as manageable as possible. This is a good list of companies to consider. I currently own Compass Minerals and have watched WD-40 for some time, so I'm looking forward to seeing how they score on the Dividend Compass in next week's post. If you'd like to stay up-to-date with the posts in this series, you can subscribe by email or RSS using the tools in the right-hand column. Or just check back next weekend. Again, please share your feedback and questions in the comments section below, or contact me on Twitter @toddwenning.